The capital City of Havana is one of the oldest in the Caribbean and a key location for pivotal moments in history. Havana today is also the results of diverse cultural influences, such as the Spanish, the African, and the Caribbean. The City is also divided into municipalities. One of the most beautiful, due to the diversity in its architecture and markedly different periods of influence, is the municipality of Old Havana. With its nostalgic architecture and facades, Old Havana is home to the more known points of interest, such as the newly renovated Capitolio and the Catedral de la Habana. However, If you really want to get the full Havana experience, here is a list of the 10 places you should know about for your next visit. This five-mile extension is one of the main attractions in Havana. It serves as a boardwalk, seawall, and is one of the main roads of access into and around the city. It is famous for its spectacular sunset views and active nightlife. It is certainly a well-visited spot for locals and out of towners. It is a phenomenal stop for photo opportunities and to see the bustling City of Havana. The Malecón also serves as an exhibit space during events, such as the Havana Biennial, an important art event that kicks off April 12th in 2019 and runs until May 12th. The Biennial only takes place every other year – don’t miss it! Coming off of the drive along the Malecón you will see the symbolic Capitolio. The Monumento a José Martí, is one of the most iconic landmarks in Cuba. It is located in Plaza de la Revolución, along Calle Paseo and Avenida de las Américas. This star-shaped tower was built as a memorial to José Martí, an important Cuban journalist and poet who fought for Cuban independence from Spain. The tower stands at over 300 feet tall on the grounds of the former Loma de Los Catalanes. It is made of Cuban marble. Next to the tower is also a marble sculpture of Martí himself. The Monumento was completed in 1958, towards the end of the Batista dictatorship in Cuba. Inside the Monumento are rooms that house Martí’s writings, the history of the Plaza de la Revolución, and an art gallery. Visitors are also able to go to the top of the Monumento to see one of the most spectacular views of Havana. The best way to photograph the structure is from across the street, where two buildings have outlines of Che Guevara and Camilo Cienfuegos, respectively. The Callejón de Hamel is a colorful highlight of the city. It is a celebration of African influence in Cuba, a convergence of music, religion, and art. If you find yourself at the Callejón on a Sunday afternoon you will be welcomed by the sound of music and the beating of the tumbadora drums, while a crowd sings and dances in unison. The walls are all covered in quotes, paintings, and unusual sculptures made out of bathtubs, pipes, and other unexpected structures. Every corner offers plenty of opportunities for lively pictures and to capture the essence of this location. Dona Eutimia is probably one of the most authentic and well-attended privately owned paladares in Old Havana. It is a small locate, situated in the Plaza de la Catedral, just outside the namesake Catedral de la Habana. The staff is very attentive and sensitive to patrons’ needs. They have one of the best traditional shredded beef Ropa Viejas and a fantastic Mojito, served in a generous cocktail glass. They also have the delicious Flan, a traditional milk custard dessert. It is the perfect stop for the middle of the day before continuing with your planned excursions. One of the biggest things Cuba is known for is its impressive collection of Classic American Cars. They bring an air of nostalgia to the Island, particularly the 1950’s when some of these cars were freshly introduced to the Island. Today, they offer a fantastic adventure to visitors. They are available as convertibles and hardtops, also called Almendrones for their almond-like shape. These beautifully preserved vehicles are a great way to ride around Havana and to get the full, panoramic view of every stop. Some of the key areas to drive along are of course the Malecón and Capitolio, the Túnel de la Habana that runs under the bay, the arch in Chinatown, and along 5th Avenue in the Miramar district, amongst others. El Cristo is another not to be missed key landmark in Havana. It sits atop a hill, sprouting at over 60 feet into the air. It was built by sculptor Jilma Madera and is made of Carrera Marble. You will notice that the statue has fuller lips and a strong physique. It is rumored to have been modeled after one of the artist’s old lovers. The sculpture is also notable for wearing sandals. The view of the city and cruise docking area from this point is magnificent. It is a great spot for pictures of the city. The Cementerio Colón mas named after none other than Christopher Columbus whose authentic Spanish name is Cristóbal Colón. The sculptures in this notable landmark are so remarkable that the Cemetery has been considered one of the most beautiful in the world. Some of the most known resting places are the Mausoleo de Los Bomberos Heróicos for their baroque detailing and La Milagrosa, where people ask for their children and matters of the heart. The Hotel Nacional is a landmark of its own and is also a recipient of the UNESCO Memory of the World Award. As you drive up to the hotel through its lavish palm tree-lined driveway, you will feel like you are stepping into an era of nostalgia. Classic American Cars can are often spotted parked outside the Hotel. As you walk up the stairs to the main entrance, you will feel as in a scene from Casablanca, with the courteous doormen and high doors. From floor to ceiling, the hotel is vibrant with elegant details worthy of the celebrities and many notables that have stayed at this award-winning hotel. Some of the important guests have been Frank Sinatra, Ava Gardner, Walt Disney, and Nat King Cole amongst others. As you make your way to the back of the hotel, take in the scenic water view and spot the large cannons displayed on the property. It is certainly a favorite for visitors and locals. The Morro Cabana Complex is a must see during the daytime and nighttime. During the daytime, walk across the Morro. 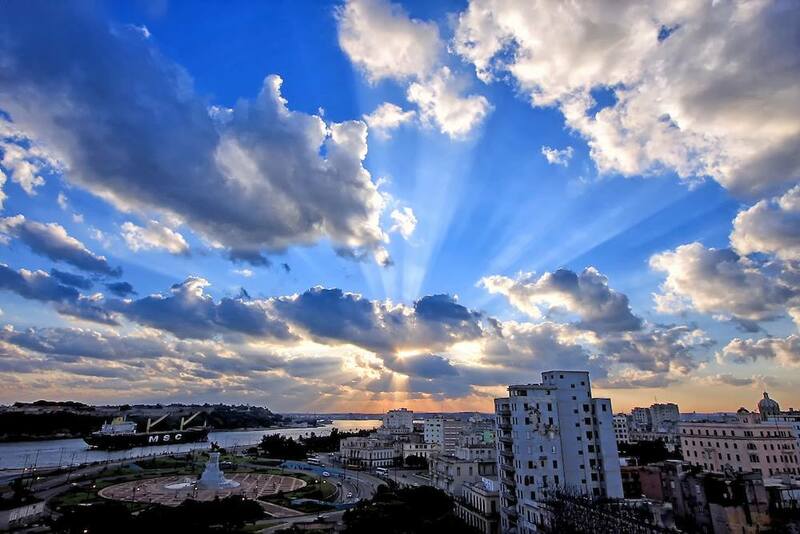 This location gives visitors another opportunity for a panoramic view of the harbor, the Malecón, and Old Havana. Within walking distance, large cannons are available for close observation. It is the spot to marvel at this beautiful city. At night, visit the Castillo de Los Tres Reyes del Morro. This stone and coral structure continues to be lined by cannons. The alleys are also a spot for local vendors with crafts and other goods. One of the highlights of the evening is the Cannon Ceremony, which kicks off at 9 p.m. during daylight time savings or 8 p.m. EST. The ceremony, presided by soldiers in proper period attire, has a dramatic buildup that concludes in the “firing” of a mock cannonball. There is something very magical about the torches, dimly lit setting, and this very real place where history was made. There are many things to do in Havana at night. Depending on what your preferred activities and settings are, try at least one or all four of these diverse options: The Tropicana, The Parisien, The Buena Vista Social Club show at Habana Café or the award-winning Fábrica de Arte Cubano. Here are some pointers to help with these options. The Tropicana Cabaret has been known throughout history as the grand, Vegas-style show in Havana. The dancers and performers are all decked out in elaborate costumes and headpieces. Each dance number tells a story to hundreds that attend this spectacular music and dance experience. During the show, you may also choose to sip on some bubbly, rum or soda of your choice in the open-air setting lined with massive lights and a grand stage. The Parisien sits in the grounds of the historical Hotel Nacional. It is a more intimate setting than the Tropicana, but also offers a colorful performance with live music and dance. You can choose to enjoy this show while sipping on a traditional Mojito. While enjoying the performance, you can snap pictures and shoot videos at will, which is one of the advantages of this performance. The cast is also formidable at storytelling through dance the evolution of Cuban history. The Buena Vista Social Club show is a must see for music lovers. This musical ensemble performs at the nightclub nestled in the Meliá Cohiba Hotel, a key meeting point for locals and travelers, right across from the Malecón in Havana. The setting is also more intimate. The space is decorated Hard Rock Café style, with local and international celebrity memorabilia, an airplane, classic cars, and even a motorcycle. The performance complete with an MC is delightful, from the opportunities for singalongs to joining the dancers on stage. It’s an engaging and interactive performance for all who enjoy live music complete with musicians, dancers, and celebrated singers. You may even get lucky and experience a member or two of the original Buena Vista Social Club. Book Your Excursion to Buena Vista Social Club. If you prefer to see an eclectic art collection in an even more unexpected setting, visit the Fábrica de Arte Cubano. This building has been transformed into a multi-function space that serves as a club, an art gallery, music, food, and libation stop. It is a popular spot for artsy locals, hipsters, and travelers. You could sit in a large blue room with open seating and a bar while looking at a Queen concert or walk into a small exhibit room with mixed-media art and fashion. Every nook and cranny have something to be discovered. Once you have been in Havana for a few days you will also start to recognize some of the landmarks across many art pieces lining the walls, ceilings, furnishings, and floors. Organizing your time in Cuba as efficiently as possible is very important. This is just a preview of the many things that can be done in the City of Havana alone! The best way to make sure you may the most of your stay is to work with a specialized travel agency, such as OnCuba Travel, which will ensure that you not only meet all the necessary travel requirements while also making sure that every stop covers your main interests and desired level of activity. Did you know that now OnCuba Travel can also coordinate your transfer, flights, hotels, and can also design a group program for you? These are just some of the advantages of this professional and OFAC approved travel agency. Contact us today to get started!